Article describes the different conditions for forced degradation in pharmaceuticals as hydrolysis, oxidation, light and thermal degradation. Forced degradation is also known as stress testing and a drug is degraded forcefully by applying artificial methods. It is a useful tool to predict the stability of any Active Pharmaceutical Ingredient (API) or formulation product. It helps to know about the impurities developed during the storage of drug products in various environmental conditions. A drug substance or product is considered stable if it shows its stability for two years at 30 ±2⁰C & 65 ±5% RH and six months at 40 ±2⁰C & 75 ±5% RH i.e. ICH storage conditions for stability testing. Forced degradation study depends upon the product and the type of dosage form. Solid, liquid and injection dosage forms have different procedures of the stress study. ICH Q1B guideline provides the guidance only on the photostability of the product. According to the FDA forced degradation study is performed during the third phase of the regulatory submission of the drug substance or drug formulation product. Limit of degradation is 5-20%. More than 20% degradation is abnormal and should be investigated. 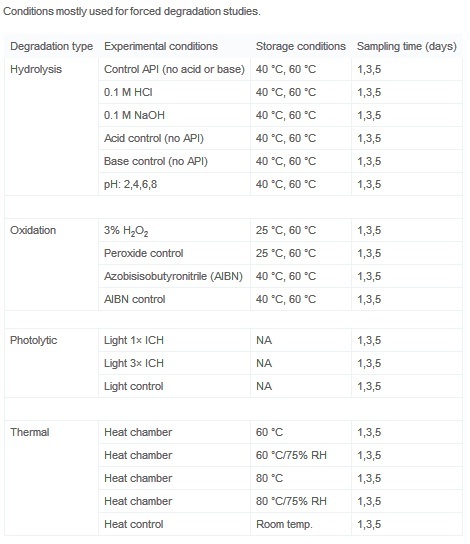 The forced degradation study should have acid and base hydrolysis, photolysis, thermal degradation and oxidation. Any regulatory guideline does not mention the pH conditions for acid and base hydrolysis, the temperature for thermal degradation or mane or concentration of an oxidizing agent. Only ICH guideline Q1B gives the guidance on photostability and states that the light source should be a combination of the UV and visible light. Following table defines different conditions followed for the forced degradation in pharmaceutical industries. A big question arises here about the concentration of the drug that is being tested for the degradation. 1 mg/ml of drug concentration is recommended for the degradation study but some degradation studies are done at the concentration of the drug in the final product. The reason behind this is the degradation at higher concentration become more than the lower concentration and exact amount of the degradation can be found in the final product and their impact can be monitored. 1. Hydrolytic Degradation: Hydrolysis is a common degradation process by the reaction of chemical with water at different pH values. In forced degradation, the drug the reacted with the water at acidic and basic conditions. The concentration of the acid or base is selected according to the stability of the drug substance. Generally, 0.1 to 1.0 M HCl or H2SO4 (Hydrochloric acid or Sulfuric acid) is used to create the acidic conditions and 0.1 to 1.0 M NaOH or KOH (Sodium hydroxide or Potassium hydroxide) is used for basic conditions. The compounds those are not freely soluble in water are mixed with other solvents to make them dissolve in HCl or NaOH. These solvents selected to dissolve the drug should not degrade it. Chemical degradation should be carried out at room temperature but when there is no degradation found at room temperature it should be done at 50-60 ⁰C. It should be carried out for not more than 7 days. Chemical degradation should be terminated using suitable acid, base or buffer solution to stop the further degradation. The analysis should be done as soon as possible after the termination of the test. 2. Oxidation Degradation: H2O2 (Hydrogen peroxide) is a widely used oxidizing agent and also used in the forced degradation study. A 0.1% to 3.0% solution of hydrogen peroxide is applied at room temperature for 7 days. More than 20% degradation is considered abnormal. 3. Photolytic Degradation: Photostability testing of any drug is done to determine the effect of light on the product during storage in the market. ICH stability guidance for photostability describe the light conditions for the photolytic degradation. According to ICH light source should be cool white fluorescent lamp and wavelength of light should be 200-800 nm (UV+ visible). The exposure time should not be less than 1.2 million lux hours and the light intensity should not be less than 200 watt-hours per sq meter. Conditions should be monitored using a calibrated lux meter. 4. 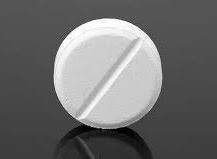 Thermal Degradation: Temperature affects the stability of the drug substance more than the other conditions. Therefore it more important factor and should be done carefully. Thermal degradation study is done at 40-80⁰C. if degradation not happens in any condition,we can accept that method or not? why do we perform acid and alkali stress?????? ?